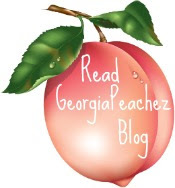 The Wreath Blog by GeorgiaPeachez: New Wreaths Are Coming Today! 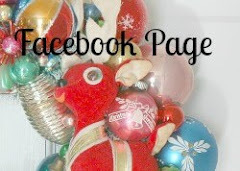 The new wreaths that I have been creating will be available on this blog starting today at 1pm EST. 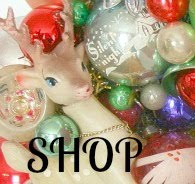 There will be a "Buy Now" button for each wreath and you can pay using your Paypal account, credit card or debit card. Welcome to GeorgiaPeachez Wreaths for 2011! As seen in e-zine SouthernFlourish.com and featured on RetroRenovation.com. 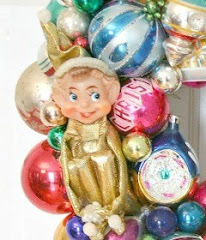 I spend all year hunting down the most beautiful vintage christmas ornaments. Shiny Brites, Polands, West Germany and Made in the good ol' USA. Each wreath is a one of a kind creation, destined to become a family heirloom. I have been making these wreaths for many years and I have perfected my time tested method. I have wreaths in my own personal collection that I store in my attic, during the hot summer, and they are still just as beautiful as the day I crafted them. The wreath measures 15" in diameter. 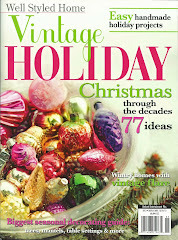 I find this is an easy size to work with in the decor, to ship and to store for the off season. I wrap the wreath form in tinsel, (no cheesy fake evergreen here!) so the reverse of the wreath is beautiful too. There is a wire hook for hanging. I adhere lots and lots of ornaments, big, small and tiny, filling in all the gaps so you see beautiful ornaments where ever you look. I purchase new shipping cartons and packing materials. Your wreath will come carefully wrapped in bubblewrap and nestled in packing peanuts. You can reuse the shipping container for storage.